Epic Gardenia, Aquarian Roses and Urban Lily make up the new spring floral trio from all-natural brand Strange Invisible Perfumes. I love many fragrances from Strange Invisible Perfumes, but it isn't exactly my "go to" brand for pretty-girly-spring florals so I was very curious to see what they'd do with these traditionally feminine floral notes. And I was extra extra curious because I was keeping my fingers crossed that Epic Gardenia would turn out to be a reprise of their gorgeous but gone Lady Day fragrance. Alas, no: as March has already pointed out at Perfume Posse, it's no such thing. The top notes are a bit heady and indolic, with a strong undercurrent of green, but that stage doesn't last long; after that, it's nearly but not quite sheer, and the "gardenia" — bearing in mind that gardenia is very difficult to extract, and so this perfume, like most gardenia perfumes, doesn't contain any "real" gardenia — is a bit less gardenia-ish and a bit more mixed jasmine-ish floral. The base is a slightly earthy plant-based musk. Gardenia in perfume rarely lasts so there's no point in going on about it: that's just how it is. Lady Day makes up for it with a gorgeous, long-lasting sandalwood dry down. Epic Gardenia, while it goes right on being pretty (and has reasonably good lasting power), simply doesn't hold my interest in the same way, although I'd probably have liked it better if I hadn't tried it next to Lady Day. If you're not pining for Lady Day, do try Epic Gardenia; if you already have, do comment. Aquarian Roses is the only one of the trio that is overtly unisex. It's sharply green and herbal in the opening (the Strange Invisible Perfumes description: "Crisp aquatic notes of wild roses brighten a warm sea of marjoram and sandalwood") and only slightly less sharp in the dry down: this is an extremely vegetal fragrance. The rose is hardly noticeable in the early stages; later, it's a bit stronger, but it isn't a rose-heavy perfume at any point, and it doesn't change dramatically after the first 20 minutes or so. In style and feeling, it reminded me very much of the line's Musc Botanique, in fact, I'm pretty sure Kevin would hate this one just as much as he hated Musc Botanique, and likewise I am hard pressed to pick which one I like best: they're both wonderful, and the lasting power is excellent. If I could have one full bottle from the trio, this would be my choice. From what little I've read, Urban Lily seems to be the early favorite. Like gardenia, lily of the valley does not lend itself to extraction, so this is another stylized interpretation; still, I think I'm the odd one out here: I simply don't get it. Urban Lily smelled vaguely of "green" and "flowers" (nothing like lily of the valley to my nose, but pretty enough) to me for about 15 minutes, then it smelled like not much of anything other than vague, nearly bland flowers over a paler version of the plant musk from Epic Gardenia. March talked about how "an hour or two later it morphs into an utterly different scent, a honey-hay-beeswax smell with a hint of something peat/leather like narcissus". I gave Urban Lily five tries but it stubbornly refused to morph into anything so interesting as that — perhaps there is something in the dry down that I can't smell? It was easily my least favorite of the three. 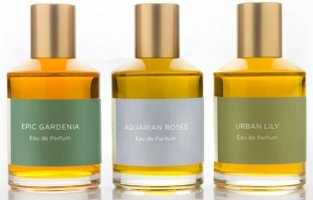 Strange Invisible Perfumes Epic Gardenia, Aquarian Rose and Urban Lily are available in 7.5 ml Parfum ($210) or 50 ml Eau de Parfum ($175); for buying information, see the listing for Strange Invisible Perfumes under Perfume Houses. Thanks so much for the reviews, Robin! Also, I am so thankful that you re-activated the custom google search. I use it ALLL the time, so thanks! I can only comment on Urban Lily, which I was so excited about, and I have tested it several times now: revolting is the only word I can use to describe it on my skin. I really don’t use that kind of description often at all, but it smells more like moldy cement than flowers, to me. Yikes, I know! Really weird. I think I have a strange perception of some natural ingredients. Some floral extractions have a similar visceral/nauseating effect on me. I wonder if others have such reactions. Glad it’s helpful — tell me, do you think the custom search works as well as it did on the old site? I’m not sure it does, would love to hear another opinion. Oh, gack! What a mental image! I’m laughing my head off. Aye, but that sort of description, it’s so, so Kevin, don’t you think? Ha, Kevin’s description is perfect. I think we’re on the same wavelength with the SIP vegetal musk. That stuff is just. wrong. Re: the google search… well, it is kinda annoying that you can’t enter a new search on the same page as the search results. You have to click back to the home page to enter a new search. Also, this little procedure is, as we say in software, suboptimal (har! ): when you do a search, then you limit it according to, say, just the perfume blogs, then you select one of those search results, you read that, then you hit the back button–most of the time your limiting selection hasn’t stuck, so you see the default unlimited results again. Hope the feedback is helpful on the search, Robin! Cheers! Very helpful, thanks! Don’t know how much I can fix…some of those seem to be functions of hosting the search on the site instead of at Google. Agree it’s really annoying that you don’t keep the search box at the top of the page — that bothers me too. Maybe I’ll go back to hosting the results at Google. You’re just complaining about the name, or you didn’t like the scent either? As a woman who spends as much time on videogames as she does on perfumes, I have to say I chuckled at the name. Names, unless absolutely disgusting, have never weighed on my decision to buy a fragrance. I do think though it was a little pretentious to call the thing “epic” though – why not just go ahead and name it “Best Gardenia Ever In The Whole World, REALLY”? I’ve not had the chance to try Lady Day, so I will look into this Epic Gardenia. I’m sad to hear Aquarian Roses and Urban Lily sort of missed the mark, though; they sounded interesting. LOL…I suppose it’s a little over the top, but then, so are many perfume names — I hardly notice any more! But hope you didn’t misunderstand me — I loved the rose, and many others loved the lily. I need to try these at some point..I managed to drag my husband a while ago to their Venice Beach Boutique. I remember liking quite a few, tho’ the only ones I remember are magazine street and Vine. Magazine street was too ‘pretty’ and not interesting enough for me at that time, though I did like it. Vine was very interesting. Lately,I have been in the mood for pretty (I am , much to my surprise, enjoying my sample of Bond No. 9 Westside which I didn’t love when I first tried it) so I might like Urban Lily? Must make another trip. I really like Magazine Street, but my favorite from the line is probably still Black Rosette, which is not exactly pretty. Also love the Musc, which isn’t exactly pretty either! Lady Day was pretty, and I do understand they’ll make it for you custom if you’re willing to pay. I love Black Rosette too, but my favorite of this line is Persica. I’s a few stems of wonderful lilac in a vase on the diing room table, with ray of sunshine hitting them. Not a bit of dampness like tht old scrubber, En Passant. I have tried very nearly all of the SIP line, but Persica is one I *haven’t* tried…will have to try to find some! Am learning on this site sometimes it’s not just me…I scrubbed En Passant too! I liked their Magazine St a lot; too bad it only lasted about 5 mins on me. I like a little more bang for my perfume buck. I got a sample bottle of “En Passant” a few months back. Sprayed it on myself in our bedroom and loved it, as I’m a big lilac fan. But, true story, I came downstairs and went to pet my greyhound. She smelled my arms intently for about 10 seconds and then ran away from me, cowering! She would not come near me until I had scrubbed my arms AND sprayed another heavy perfume over the offending “En Passant”. I hated to give it up, but sent my sample to my mother. Which means- I remember(or atleast think I remember) Vine too..I tried all of them in the span of few hours. Must revisit. The only one I revisited was Magazine street (sample of the EDP from beauty habit)..
It’s hard to try so many scents so quickly! I wish they sold sample sets from the SIP website since Beautyhabit doesn’t have the whole line. Ack…but actually, maybe they do! I haven’t checked lately so shouldn’t have implied they don’t sell them. I’m very certain they had the EDP in the store though! I sprayed it on the blotter strip. It isn’t on the website though…and could swear someone told me all the testers in the store were EdPs, even for those scents only sold in extrait? But I’m not sure. Lady Day sounds like it was quite a thing to experience. You make Aquarian Roses sound nice, and I’ve been curious about Black Rosette, but SIP is one of those lines that I just haven’t lusted after at all. I was sent a sample of Fair Verona recently; I just dabbed a bit on again and it’s nice enough but again, not something I *must* have, especially at those prices. But I really appreciate their craft and am always happy that someone is making naturals. Fair Verona is nice but not one of my favorites, and I don’t think it is necessarily a good introduction to how unusual some of their scents are…not that you need another spendy niche brand to love, mind you! I have to say, the SIP store in Venice is a wonderful experience. Even if you’re not a fan of their creations the woman who is generally there (Nicky) is so friendly and awesome – I once spent 2 hours there just sitting with her and sampling every one of their perfumes. She sent me home with a sample of Atlantic and Magazine Street. The Atlantic I loved at first – I swear it was what I thought I wanted to smell like forever – but somehow after a few days I no longer thought that! Magazine Street really grew on me and after both vials were gone it’s that one that I actually miss the most. The prices…. oh the prices… but still after that experience I will be back to buy some day, as it was really one of the first perfume stores that I’ve been in where I felt like enjoying the perfumes was even more important than buying right away. How nice — would love to visit the shop! The prices for the perfumes are high, but these days the prices for the EdPs don’t seem so outrageous to me…not all that much higher than other niche brands, and comparatively cheap in comparison to other natural brands. Well, me too, but SIP seemed scarier when they started out w/o the EdPs, and I also think they’ve maybe kept their prices steady while others have raised them…at any rate, they used to seem outrageous to me a few years ago, now it seems normal. 1. Why do you say that gardenia might not be “real” in Epic Gardenia, if they are “all naturals” niche? This means that Crystal Noir from Versace, which vanted to be “headspace” extract, was a mere fantasy? 2. Talking about extracts difficult to obtain, I wonder why there are so few perfumes containing linden tree flowers (Tilia cordata) or acacia (Robinia pseudacacia). Both have strong perfumes and grow easily. 3. There could be an entire discussion about the link between the bottles and the perfume. The bottle has the strongest impact on the definition of a perfume, because smell has no eyes, therefore we associate the sensation with a colour or a visual image. (for example Kenzo indigo is realy indigo, and Loulou Blue was really blue, even though that’s absurd. Those three bottles from SIP don’t say anything, are ugly and contrast the juice with the label in a medicine manner. They are using other natural materials to create a gardenia accord. Headspace technology is used to create synthetic aromachemicals that mimic natural materials. Linden is not all that rare in perfumery. Don’t know about acacia. The bottles are utilitarian…and not sure in the natural, hand-crafted niche that people care so very much. Robin, I had the same experience with Urban Lily. I looked up my own notes, where i said ” pale, creamy lily and something green”. That’s about as in depth as I went as I lost interest. No interesting dry down for me either. Good, glad I’m not the only one! Did you try the other 2, and what did you think? I really like Epic Gardenia. Typically when things go musky, I get turned off, but this one works for me, and lasts all day! I think the woods are very well blended so the musks don’t become too overbearing. For a gardenia that stays very true throughout with a hint of woods you ahould really try Ajne’s Fleur Blanche. I’d be very curious to hear your opinion. I’d be more than happy to send you some! Thanks, will dig through & see if I have a sample of that! OK, let me know. I’d be happy to send some along.